When I came across this post on iGNANT I was immediately intrigued (and maybe a bit concerned for the welfare of the pigeons.) The series of work entitled Some Pigeons are More Equal than Others is by Artist Julian Charriere who ‘dyed’ 35 pigeons with a mechanic apparatus that trapped the birds and then airbrushed them. Once the pigeons were coloured they were released to resume their daily life with their new colourful plumage in full display. Charriere wanted to provide city dwellers with a new experience – something different injected into their daily routine. I imagine the experience of seeing these colourful birds was similar to the way I felt when I first encountered an exhibition by The Atlas Group many years ago, one of uncertainty, but with a desire to learn more, to question what I was seeing. The Atlas Group was a fifteen year project developed by artist Walid Raad that created and presented archives that were about the contemporary history of Lebanon with an emphasis on the Lebanese wars of 1975 – 1991. The Atlas Group was a fictional organisation with a main agenda of researching and documenting the contemporary history of Lebanon. Through the presentation of documentary fictions as factual documents, Raad explores the dialectical notion of the real and invented, fiction and non-fiction. Raad seamlessly integrates actual documentation with fiction guiding the viewer to look at the lies and to look for the lies. At this point, I had not heard of The Atlas Group so I took everything at face value. The first series of black and white photos were entitled, Civilizationally, We Do Not Dig Holes to Bury Ourselves, dated 1958-1959/2003 and were presented as the only remaining photographs of the doctor. Looking at these images, there is an immediate sense that something is odd about the doctor’s ‘presence’ within the photographs. Walid Raad, Civilizationally, We Do Not Dig Holes to Bury Ourselves, 2003. Why would someone posse an image of himself lying on a bed in a hotel room reading a book or eating alone in a café or under the Eiffel Tower looking through a set of binoculars in the opposite direction? The circumstances in which these images were taken are uncertain. I immediately started to question who took these photographs? Why hasn’t the doctor acknowledged the fact that he was being photographed? Were they staged? Were they real? Was Dr Fadl Fakhouri real? On my way home I kept thinking about this work and who was The Atlas Group. During the time of not knowing my imagination was running wild, trying to decipher what I had seen, what was real, what was fiction, it was truly a great experience. I think the same would have occurred when the citizens of Copenhagen saw these pigeons, they would have experienced a suspension of disbelief – believing maybe for only seconds or minutes that these colourful birds really did exist and flew with the pigeons or maybe they were pigeons. I think this would have been a great encounter, a magical moment being suspended in disbelief if only for a few minutes. Images from Dr. Fadl Fakhouri’s notebook which contain photographs of cars that correspond to the exact make, model and colour of every car that was used as a car bomb between 1975 and 1991. 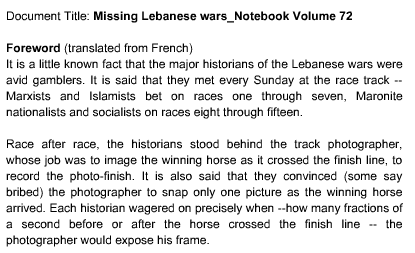 This notebook depicts avid gambling habits of the Lebanese gamblers. It is said that every Sunday Marxists and Islamists bet on races one through seven and Maronite nationalists and socialists on races eight through fifteen. Walid Raad, Missing Lebanese Wars (Notebook Volume 72), 1996. The Atlas projects reveals the fragmentation of events that is experienced by war. By collecting certain fragments of truth one can illuminate a whole. By choosing different means of documentation The Atlas Group, reflected the instability of history and how complex events cannot be systematized or condensed into easy groups of information.